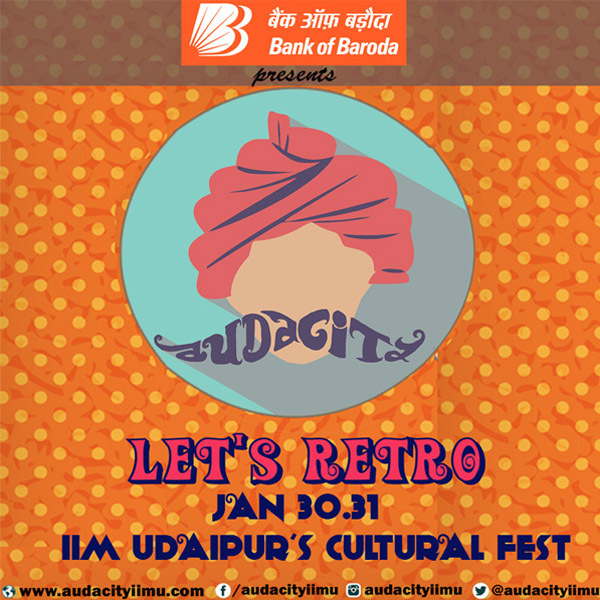 The annual cultural fest of IIM Udaipur is back with a bang –Audacity,sponsored by Bank of Baroda will be hosted at the MLSU campus on the 30thand 31st of January, 2016. The event is a microcosm of fun and frolic, with 60 action packed events spread over one weekend. This year’s theme ‘Let’s Retro’,is a tribute to the styles and fashions of the yesteryears. In the previous edition of the event, Olympian Vijender Singh kicked off MTV roadies from the campus and the Indian rock band Parikrama blazed the stage with their performance. This year too we have performances by the band Euphoria, led by Dr. Palash Sen, an array of amazing group and solo dances, and a musical battle in the War of Bands among other things. Another highlight of the event is a beauty pageant show – Campus Princess – which will be judged by Koyal Rana, winner of the 2014 edition of Femina Miss India, in association with the Miss India organization. The event is the west-zone auditions for the Femina Miss India 2016. The Indian Institute of Management Udaipur aims to make a meaningful difference in whatever activities it does. A strong sense of social responsibility is imbibed in all of IIM Udaipur’s activities. The institute is committed to giving back to society, playing a role in local development and being in the vanguard of applying principles of ecological sustainability. Events like Street Play would be hosted to develop awareness regarding socially important topics. The institute has planned a tree plantation drive to flag off the eventthis year. Prayatna – the social responsibility club in association with Silvertongues – the public speaking club of IIMU have organized a debate competition for students of schools in Udaipur city on burning issues facing the city and the country.